Larry Wilson is a native of Cleveland, Ohio but was raised Jacksonville, Florida. He began his love affair with music at the tender age of three playing the drums in church. 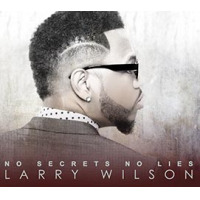 Unless you are fortunate enough to already know about Wilson, you'd never guess he is a young man that has just released his debut album, No Secrets No Lies. Whether you dig Be-bop or modern jazz, there is something for every on this album. Wilson takes this opportunity to express his love of great music with impeccable feels, and both Wilson and his band possess the wide dynamic range to deliver. The sixteen tracks are full of moments of: jazz, fusion, soul, and gospel. Wilson and his fellow musicians are easily able to keep within the deep tradition of jazz, while exploring the creative innovations that are developing the music forward. On the opening number, "On the Move," Wilson's musical ear has whispers from the late Coltrane period as his targeting muse, while mingling amongst each other the free form opening serves as a solid opening statement. Once the band establishes the groove, we hear that at the root of the song is lurking a bebop style, riffing and whirling, set to a modern driving pulse. The song pounds like a rugged, primal dance, to be taken according to your wherewithal. David Stewart on alto saxophone and Todd Delgudice on tenor saxophone, both take exciting solos. Wilson's drumming is on fire! He is supportive and interactive, think Elvin Jones and Tony Williams all rolled up into one. Fans will drown in the textures and feelings this composition's form offers, which is penned by Wilson and Stewart. "Ode to Oscar" is up-tempo selection penned by Wilson. With a melody that is again a nod to the sophistication of be-bop, its feel changes and harmony no doubt are intentional modern statements. Alto Saxophonist Daniel Dickinson tears up the sonic airwaves with his impassioned palate. Pianist Joshua Bowlus is in his natural habitat, for him flowing lines and colorful chords are as natural as breathing. Wilson's obviousness with music that feels good is undeniable, his solo at the end of the track somehow seems to even take the energy up a notch. The speed and rambunctiousness is all naturally maintained on "Midnight Oil." Ray Callendar's trumpet solo is very strong, he seems to play each note with the attitude of 'You're mine, I own you!' Dickinson bellows in top fashion and Wilson and up-right bassist Mike Perez chug out a storm of feel. The compositional flow and form keeps pace with energy of the players, with elevating horn writing and nimble feel changes, it brings the song to full vigor. It's a telling of where contemporary jazz is heading and it is in a good direction, even for those with an affinity of 'jazz ended in the fifties' mindset. A quick right to "You Seem Familiar," which will catch on with soul/funk/gospel faithful. Here the band crams every ounce of soul and good feeling into every space and note. Jeremy Sauer's rich bass shakes the house, as Wilson's groove loving gambol underscores the space behind the band and vocalist Akia Uwanda. Not only is Wilson responsible for penning the track, but he also plays an incredibly soulful Fender Rhodes solo. The horn writing is voiced very nicely. Uwanda's vocal solo at the end is rich and full of rhythmic fun. The predominant theme to No Secrets No Lies has to do with music that feels good and it is noticeable. Wilson's identity as a musician and composer have more to do with attractive feels and beats, largely based is jazz swing, soul and gospel. This is an uplifting and frankly heartfelt reflection of the time Wilson has spent absorbing both the past and future of jazz, while sporting a wonderful collection of tunes, truly holding true its namesake title No Secrets No Lies. Track Listing: On the Move; Ode to Oscar; Little Sunflower; We Found Love; You Seem Familiar; Open Sesame; The Afterglow; Love Me in a Special Way; The Lord’s Prayer; Light; Midnight Oil; Release; Blue Skin; See You; Tuti’s Jig; April in Paris. Personnel: Larry Wilson: drums, percussion, Hammond B3 organ, Fender Rhodes, piano, synthesizers, bass guitar, and vocals; Joshua Bowlus: piano, Fender Rhodes; Lawrence Buckner: upright bass; Daniel Dickenson: alto saxophone; Todd Delgudice: tenor saxophone; Ray Callendar: trumpet, flugelhorn; David Stewart: alto, tenor saxophones; Mike Perez: upright bass; Jeremy Sauer: bass guitar, acoustic guitar; Cory Wilcox: trombone; Jesus Rodriguez: tenor sax; Bryant Patterson: trombone; Celest Betton: vocals; Akia Uwanda: vocals.